Welcome to Parrot Haven, Atlantic Canada's newest website dedicated to the fascinating world of parrots. Parrot Haven is coming along GREAT!! Come and meet Buddy our 6 year old Cockatiel and Gomez our 3 year old Yellow Crowned Amazon and Amuk or 18 year old Military Macaw in the all new Photo Gallery. 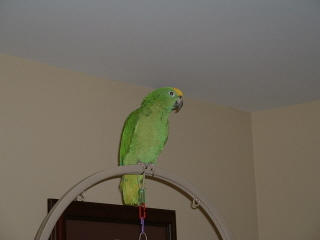 Parrot Haven is located in Cherry Brook Nova Scotia, just outside Dartmouth. Our goal at Parrot Haven is to create a fun and informative site pertaining to Parrots, their health and training. 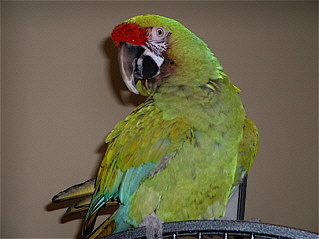 Recently the Parrot Haven Family has been focusing on building the Parrot Haven Parrot Rescue . Check us out in the forum under Parrot Rescue or on Facebook under Groups. Gomez The Amazon and Buddy The Cockatiel. " I did'nt do it...well neither did I"!! "Must have been the dog!! Mom Dad, I'm a Chicken Hawk! !